← The Age of Muddle? Praise be to God indeed! Thursday’s Papal encyclical on climate change breathes fresh air and spirit on a world and on a climate-change debate sorely in need of both. The depth and breadth of the discussion defy casual summary. To attempt to identify and lift nuggets from the larger whole or to pick-and-choose cafeteria-style among the arguments presented is misdirected if not futile, though we’ve seen numerous attempts in all the news and social media in the days since. What makes the nuggets truly golden are their settings – the precise wording and the carefully-woven context. That weaving is so deft and intricate that attempts to unravel particular bits from the fuller exposition leave something far inferior to the whole. In other words, to feel the impact you and I had best read the encyclical in its entirety. That encouragement doesn’t even go far enough. To go further – not merely to feel its impact but to derive its benefit, to experience its healing – we need to meditate on it. And we’re not talking about meditating on it over a single weekend. The encyclical deserves regular revisits. Over months. Years. It’s going to stand the test of time. The encyclical is more about human nature than Earth’s nature. In fact it sees the two as inextricably intertwined, inseparable. Furthermore, it sees climate change not as a separate issue, or even as an issue in its own right. Instead it’s a symptom of human failings and shortcomings: greed, selfishness, hypocrisy, mendacity, etc. You could add shortsightedness except that at several points the text notes that we’re not merely oblivious to our wrongs and how they exacerbate the problem. Our actions are premeditated. We possess the needed self-awareness, and we see the bow wave of problems we’re creating for the poor and disenfranchised, for those less fortunate – and yet we proceed anyway. It sees these realities and our human challenges as fully integrated and inseparable. For example, the encyclical makes clear that our environmental problems stems from seeing nature and all its life and creatures as being mere objects as opposed to essential manifestations of the love and power and nature of God. It sees our indifference to the plight of lifeforms and landforms as intimately related to our disinterest in the suffering of others. It describes us as having allowed ourselves to drift into a state of slavery to technology as opposed to retaining mastery over it. It is fully comfortable with both science and faith. At one and the same time the encyclical holds true to the idea of a created universe and embraces findings of science with respect to the size of the universe, the age of the earth, evolution of life, and the nature of reality at the quantum level. It is positive about the contributions of science and technology not just to material human welfare but beauty and the elevation of the human spirit. And interestingly, it doesn’t dither over these concerns; it simply blows right through them. Surely an encouragement to the rest of us to follow suit. The moral message ought to arouse us more than the economic message. The encyclical makes much of our interest in individual material well-being as measured by conventional means. This has already come under attack from some quarters as “the pope urging us to all be poor.” But the deeper message of the encyclical is that when we enrich ourselves while turning a blind eye to the basic human needs of others – whether for food, or water, or shelter, or respect – we do great and indelible harm to our souls, and that this is the greater danger. The encyclical is more celebratory than condemnatory. Throughout – in every section and every reflection, the encyclical reminds us that the Creation is good. It sees every aspect of physical reality both animate and inanimate as carrying a message about God’s love, power, interest in our well-being, and forgiving nature. It speaks to our access to joy and peace in light of this understanding. It speaks to the possibility of building a richer, more equitable, more sustainable, future. It is a group construct. Surely Pope Francis called for it. Surely he made editorial comments as the work proceeded, and had a good deal to say about both its substance and tenor. But the encyclical clearly has as much in common with an IPCC report as it does with the prayerful reflection of a saintly, devout individual. There are frequent, quoted references to thoughts and contributions from bishops from around the world. Much as an IPCC report, the chapters and conclusions are informed by the scholarship and study of many other individuals, past and present, who are extensively and thoroughly cited. Did I say you ought to read the whole thing for yourself and draw your own conclusions? Yes. 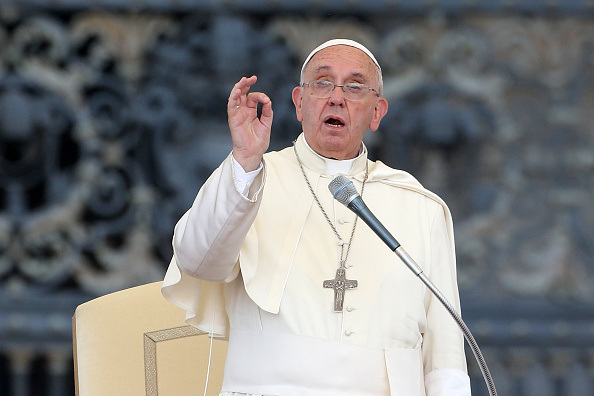 Is the encyclical the last word? No. Is it a perfect document? No. Is it something you and I would do well to discuss seriously with each other? Build on and improve? Absolutely, no matter who we are or what our role. Mother nature is a sceptic and she’s not warmed in 18 year and not any the human-adjusted temperature datasets shows even the lowest predicted warming since the IPCC gave testable predictions in 2001. There are no adverse trends in severe weather and generally CO2 is being entirely beneficial with a general greening of the planet and record harvests. However, you wallow in his vision of a “pile of filth” if you want. The rest of us will celebrate what we’ve achieved for humanity via cheap energy and all it has brought from modern communication to healthcare to transportation that brings us altogether. I’m still struggling through the document while I’m trying to get out of town but wanted to weigh in just a bit. I think everyone can agree that there is a moral imperative to take care of the environment. Certainly there is one to take care of those less fortunate. However, I am finding the blind acceptance of the global warming meme (has anybody actually demonstrated that CO2 is really pollution, or that a warming climate is actually worse than the one we have now? ), the simplistic linking of the environment and poverty, and the implication that those who have more are somehow morally compromised compared to the poor all to be a bit off-putting. I am strongly against virtually all of the policy alternatives I have seen advocated by the warmistas (= warming alarmists), for three reasons. • The ones most negatively impacted by these policies will be the poor, especially the working poor in the US, and those in the developing world. • Until we have greater certainty about the science, the dangers of unintended consequences of these policies appears to me to outweigh any potential benefits. • They frankly won’t work, based on models such as those used by the EPA. Bill, as always, I thank you for making us all think about the issues you bring up. You have built an island of civility in an increasingly uncivil world. This post provides a great preview of the content and tone of the encyclical. I would still encourage everyone to follow recommendation 1: Read the original text! It is beautifully written, thoughtful, and covers a vast range of spiritual, moral, and scientific issues. I found its arguments both more interesting and more compelling than anything I have encountered in recent governmental or intergovernmental reports. Bill: Another thoughtful and insightful piece. Thank you! The Encyclical can help scientists step out of our minds and evidence-based-only judgements and into our hearts, where our moral compasses reside. The Pope’s Encyclical is perhaps the first piece that guides us to this call with such simplicity and openness. No one is judged, all are invited to ponder, question, and to act differently or better than before.